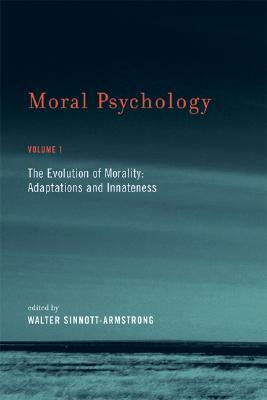 Moral Psychology is a compilation of articles and arguments on the evolution of morality, where each article is accompanied by a few short rebuttals and a counter-rebuttal. Though the material is written by academics on current themes in psychology and evolutionary biology, it is fairly accessible, not technical, and informative. Without any training on the subject and simply an intellectual curiosity, I felt like I was able to follow the arguments and gain some interesting insights into how researchers think about and analyze theories within this new field.My two favorite themes in this volume were written on human cognitive computation and logic, and whether or not morality is innate. Cosmides and Tooby wrote an article on the former theme called "Can a General Deontic Logic Capture the Facts of Human Moral Reasoning? How the Mind Interprets Social Exchange Rules and Detects Cheaters". They argue that moral brain is likely composed of disparate computational structures that domain-specific and, together, form the human cognitive machinery. By domain-specific I am mean subject specific; for example, they argue that humans show different reasoning capacities when it comes to social interaction than when they are reasoning about, say, mathematics. This is evidenced in what is called the Wason selection task. Participants are given a logical argument of the form P -> Q and asked to find a combination of facts that would disprove P -> Q. For anyone familiar with logic, the obvious answer is P * ~ Q, or P and not Q. So, people more easily identify how to violate the statement "If a person is drinking beer, that person will be at least 21 years old", than "If a person has Ebbinghaus disease, then that person will be forgetful". The performance of participants varies with subject, and, more specifically, when the P -> Q statement is about social exchange/contracts, people perform better. This fact is true even for above average intelligence (e.g. Harvard undergraduates), and people trained in logic. The second theme that I found most interesting related to the question of whether or not morality is innate. This question relates to the Chomskyan revolution in linguistics: during the mid 20th century, Chomsky, contrary to the popular behaviorist explanation of language acquisition of his time, showed that language acquisition is not simply a learned behavior but develops as a human arm develops - as a natural growth due to an innate structure in the human genetic endowment. A similar question can be asked of human moral reasoning - do we have an innate moral structure that determines the way we make moral judgments. Multiple arguments are made for and against the proposition in the book, and I would recommend it for reading if you find such ideas interesting. Really great read. I love how these volumes are structured. Each article is followed by at least two critiques from other specialists, which are then followed by a response from the author of the original article. The format really gives the reader a strong sense of how each debate plays out, and it's a lot of fun to observe these highly intelligent folks throw their big brains around. Definitely makes me want to tackle more edited anthologies like this, rather than reading whole books where every chapter is by the same author. Particularly interesting articles: Cosmides and Tooby, Lieberman, Sripada, and Prinz. However, I thought all the articles were excellent. With the exception of Fodor's poorly argued and pompously written response to Cosmides and Tooby (they eviscerated him in their reply), I also thought all of the critiques were very good. Overall, I think Prinz's article made me think the most, probably because I disagreed with everything he said when I started reading, but by the end he won me over on a few points. It does seem like we need to compile more hard evidence before we start assuming that neural mechanisms evolved specifically to handle moral processing. I'd be really interested to see how Cosmides and Tooby would respond, because I felt like they made the most convincing, evidence-driven case for having isolated at least one domain-specific module to handle certain moral situations (Social Contract Theory).Overall, I think this volume attests to the reality that evolutionary psychology, even though far from being able to make incontestable claims about the origins of human morality, is still at the forefront of directing us toward the right lines of inquiry when it comes to descriptive as well as normative ethics. Can't wait to start volume 2. This book took me a little over a month to read and digest. The book reads more like a debate between the contributors and I think this is what adds to its character. Most books you will only get the proposed theory of said author(s), but never be exposed to rebuttals by other specialists. The format is set by an initial article, followed by multiple rebuttals, followed by a final response by the original author(s).It was extremely refreshing to see philosophers merge their field(s) of expertise with the fields of psychology and neuroscience. After having been dominated by rule-based religious ethics for centuries, the study of morality has finally entered the scientific realm. My favorite article is the opening article itself. "Naturalizing" ethics is greatly needed if we are to have meaningful moral discussions in the 21st century. And though this book is rather technical, I do think it's still worth the read for those interested in the topic of human cognitive computation and logic, and whether or not morality is innate.